Our washing machine decided that for the New Year it was calling it quits! After waiting for a week on a repairman to come, only to be told saving it wasn’t a viable option; we waited another week for a new machine. It arrived today and I’m so excited that I don’t have to haul bags of laundry to the laundromat in rainy weather again. I’ve got my first load going as I write. The house has a happy hum to it and Mr. Michie won’t have to go to work naked tomorrow. So, it’s a win, win all around. This entry was posted in Home and tagged cleaning, cottage, Home, Life, Mr. Michie on January 24, 2018 by jennifermichie. I’ve tried to write this post 1/2 a dozen times but life lately has put a stop to it. I’ve had things to share, but for now they’re not important. The cottage is quiet today, I feel quiet today. 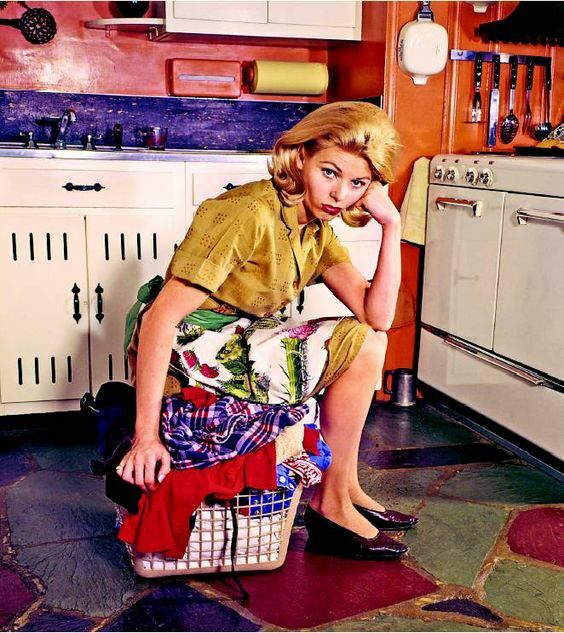 The only sound is the hum of the oven, baking a fresh loaf of bread. I went for a run this morning in the freezing cold and darkness, but I was rewarded by getting to see the sun rise as I crossed over the train bridge. It’s the little things, right? It’s very windy here today, but the sunlight keeps coming and going, drifting through the window and is slowly starting to crawl across the wall and towards the mantel. All of Christmas has been tucked away now and the house doesn’t feel so much bare as it does streamlined. Sitting on the mantel are a pair of strawberry pink candles nestled in the antique milk glass candleholders my parents gave me for Christmas. A clear glass bowl of moss covered grape hyacinths with their shoots poking through the soft green mossy blanket, rests between them. I love that I can see their creamy white roots running down into the dirt and moss that line the bowl. It’s like getting to watch a science experiment. In front of your eyes Nature grows, in all of Her glory. The candles are lit and the kettle is on, as I think only copious amounts of tea can warm me up today. Here’s to Friday, because I’m already ready for it! This entry was posted in Home and tagged cottage, Home, Life, organized on January 17, 2018 by jennifermichie. Since my last post about reorganising the closets, we’ve given away a whole lot more! The grand total now stands at 10 garbage bags and one large shopping bag worth of clothing, fabric, towels and home accessories. Decluttering is an amazing thing, it frees the space and it frees you. I haven’t missed anything that we have donated. I’m truly enjoying the bits and pieces we decided to keep. I took great pleasure in making a loaf of bread yesterday, on countertops that were practically devoid of clutter. It’s very cathartic and something this little dollhouse and us were desperately in need of. This entry was posted in Home and tagged cleaning, cottage, Home, Life, organized on February 21, 2017 by jennifermichie. Six bags. Six garbage bags: each one filled to the brim with clothes that are now too big for us, since we started running. Six garbage bags filled with clothes, shoes and winter coats that were swallowing us whole. Six garbage bags that we’ve donated to charity. The house feels empty; in an odd way. No one but us ever sees what’s behind the closet doors or inside the dresser. Now, they are incredibly streamlined. Everything has been organised so it is easily visible when you open the drawer. It feels empty, but it feels so good. And we have a list of a few items that need to be replaced, in smaller sizes. It was a mentally and physically exhausting process that took us two days to complete. This entry was posted in Home and tagged cleaning, cottage, Home, Life, organized on February 13, 2017 by jennifermichie. Well, it’s a Thursday alright! We’re doing a major overhaul in the cottage. Cleaning, gutting and downsizing. I made two trips to one charity store this morning to bring them two side tables we were getting rid of. Mr. Michie helped me make the other trip before work, to a different charity shop, that will take electrical items. I’ve dusted high up places and low down underneath places that haven’t been dusted in awhile and in doing this my vacuum broke. It hasn’t been very happy for a bit, so I guess it thought today was a good day to go. I’ve been a very good girl this year, so there is one winging it’s way to me now as I type. So, I thought I shall take a five minute break, catch my breath, re-work my plan of attack for the day and share something with all of you. I saw this gem on Monday and it is just pure Wes Anderson happiness. So, here’s to the first of the month and here’s to Thursdays, let them be short, so we can move on to Fridays and then on to the merry weekend! And, wherever that train is going, I want to ride within it’s mint green walls and rattle down the tracks. This entry was posted in Home and tagged christmas, cleaning, cottage, H&M, Home, Life, organized, Wes Anderson on December 1, 2016 by jennifermichie. I just made it inside yesterday before the sky opened and a thunderstorm commenced. I lit candles and watched the rain pour down from our bedroom window. It was cool yesterday after a hot weekend. The weather made it a perfect excuse to make something comforting for dinner. 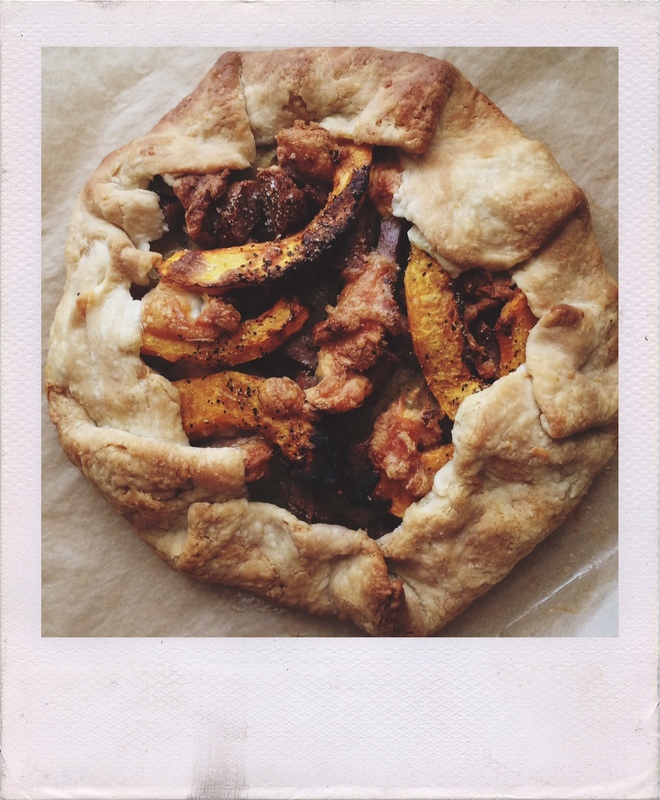 By using up leftover sautéed onions, sausages, butternut squash and some goat’s cheese, we whipped this galette up for dinner. I love to create new meals out of leftovers, it makes them more exciting. Although some leftovers don’t need to be tampered with. You can’t beat a good turkey sandwich after Thanksgiving or leftover meatloaf turned into a sandwich oozing with ketchup! Served with a salad, this savoury galette was the perfect Monday night dinner! This entry was posted in Home and tagged cooking, happiness, Home on June 14, 2016 by jennifermichie. I just know this woman is welcoming us into her home. 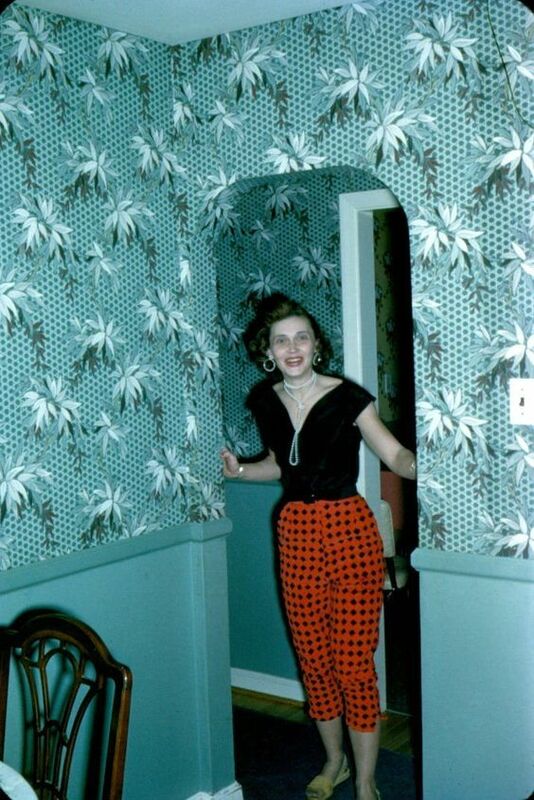 Don’t you just love this woman’s outfit and the wallpaper. What a photo! This weekend is the beginning of the end of my time off with Mr. Michie. I treasure this time. We’ve spent the morning doing odd jobs. We’ve ordered a few bins to finish off organising the closets and then that job is officially ticked off the list. We’re catching up on podcasts and we’re listening to a lot of music. We seemed to have moved back into a Jazz and 70’s phase. So lots of Dexter Gordon, Miles Davis and ELO are being played in the house at present. We made BBQ this week and are turning the leftovers into tacos for dinner tonight, we just need to plan a menu for the next few days. The first week back to school is always a killer, so if we can be organised about it, it makes everything run much smoother on the home front. This weekend also heralds in The Masters, so I think some fried chicken and pimento cheese sandwiches just might be in order along with some sweet tea, of course! I have my favourite and I’m pulling for him, just like I was last year. I’m looking forward to a weekend filled with walks, coffee, candle light, good music, great food and even better company! Here’s to the weekend, long may it last! This entry was posted in Home and tagged Electric Light Orchestra, happiness, Home, Life, Music, The Masters Tournament on April 8, 2016 by jennifermichie. Today we attacked our bedroom closets and I am now sitting amongst a scattering of bags filled with items to donate to the charity shop. The house smells amazing because we are slow roasting a pork shoulder to make BBQ for dinner tonight. So dinner and another area decluttered are two things I can tick off of my list today. 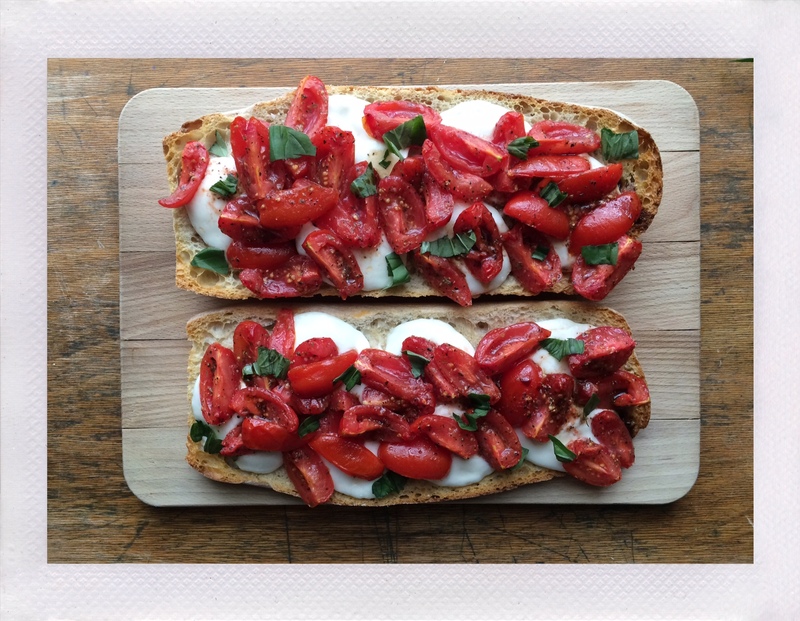 To fortify us for an afternoon spent gutting closets, we made bruschetta for lunch. 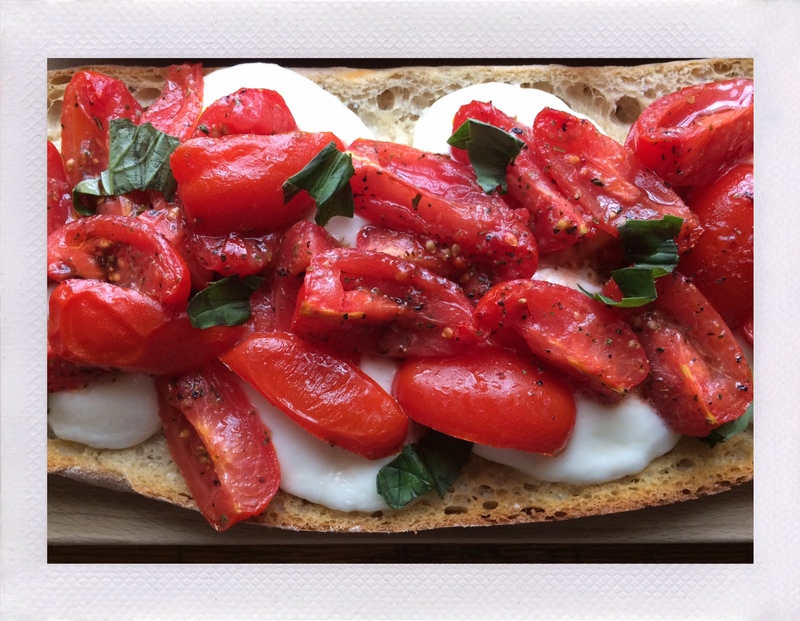 I marinated the tomatoes over the morning so they were extra flavourful before spooning them over a loaf of ciabatta that I had drizzled with oil and rubbed with garlic before toasting. Fresh mozzarella sat on top while the tomatoes were delicately nestled all around. A few sprigs of torn basil and a splash of balsamic vinegar and lunch was complete! This entry was posted in Home and tagged cooking, food, happiness, Home on April 6, 2016 by jennifermichie. It’s crisp today with a silvery grey sky. I don’t mind, I’m staying cozy inside. My candles are lit, I’m listening to music and working on a weekend menu. Tonight we’re having a big Greek salad and home made tiropitas. One of my favourites! My mom has always made them and I learned how to do it through her. They remind me of Spring and being little. The taste of warm salty feta oozing into your mouth as you bite through the buttery crisp pastry, makes my mouth water. I’m taking a break from decluttering and downsizing and working on a personal project. We now have two more large bags of items to donate to the charity store and I know that there will be more to come, once I tackle the bedroom closets. It is a refreshing change to be able to easily walk into the pantry and grab a cookbook or mixing bowl without having to complete a yoga balancing move to get what you are after. I have yet to miss anything that we have donated or recycled. I have secretly worried that I was one step away from being on the TV show Hoarders, but considering that I am an excellent de-clutterer, organiser and cleaner and can make these decisions myself without someone putting all of my possessions in my front yard to go through, I think I’m doing alright. We’re each planning for a quiet weekend, doing things around the house, completing a few work tasks, eating good food, going for walks, listening to music and just being. Here’s to the weekend, long may it last. This entry was posted in Home and tagged cleaning, cottage, Home, organized, the weekend on March 18, 2016 by jennifermichie.